mms plus' woman of fortune hall of fame: Is empowering women the answer to ending poverty in the developing world? 'Women make up half the world's population and yet represent a staggering 70% of the world's poor. We live in a world in which women living in poverty face gross inequalities and injustice from birth to death. From poor education to poor nutrition to vulnerable and low pay employment, the sequence of discrimination that a woman may suffer during her entire life is unacceptable but all too common.' The Global Poverty Project. Millennium Development Goal 3 is to promote gender equality and empower women. 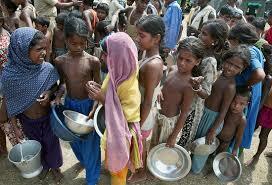 Poor Children on queue for food can women be the solution to this problem? This MDG is critical for tackling poverty and improving prospects for women. But how can women break gender based stereotypes to minimize discrimination and reduce gender based violence when they are trapped in societies with socio-cultural practices which routinely discriminate them from having equal opportunities in education, health and livelihood? These women are invisible and the obstacles in their way prevent them from accessing the most basic human rights and needs. The outlook is bleak.